This pass isn’t really noticeable as such and in fact when we first rode it en route to the Grossglockner High Alpine Road we didn’t even notice it. We only realised after we’d got back when Phil was checking ViaMichelin for some route details. 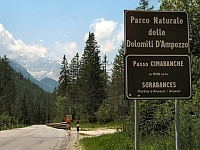 The road over it is a pleasant sweeping road taking you from Cortina north to Dobbiaco, albeit with a few sections with a poor and deformed surface. On the way north from Cortina after passing the summit you can take a right turn up the Passo Tre Croce.